Dear daughter: What is the best graduation gift I can give you? The best way to launch you into life? And do you know how to wash your cheerleading uniform? These were the questions facing Lisa James McKenzie as her daughter finished her senior year of high school. The result is The Laundry List, All the Things I forgot to tell you about Laundry and Life, a mixed bag of incident reports from the front-lines of the laundry room, instructional memos, advice from neighbours and family stories. There’s even a recipe for dippy eggs (with accompanying stain removal instructions). From Murphy’s law of tissue to minding your own laundry basket, there’s plenty of advice to ensure that the new university student will be well-equipped for both the laundry room and life. 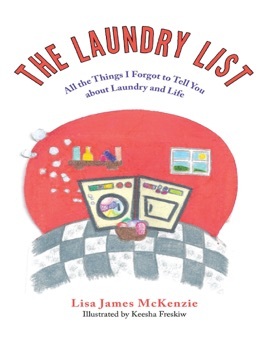 The perfect gift for any young adult embarking on life after mom, The Laundry List shares funny, practical and profound wisdom from a mother as her daughter embarks on a new adventure away from home.